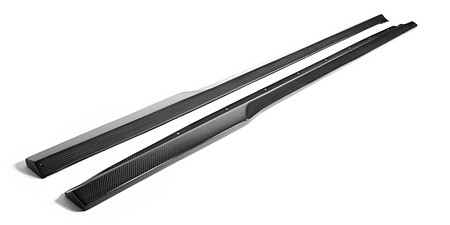 ModBargains.com provides APR Performance Carbon Fiber Side Rocker Extensions for Audi A5 2007-Up. Call to speak to one of our Modification Specialists @ 714-582-3330 and start your savings now! APR Performance's Carbon Fiber Side Rocker Extensions for Audi 2007-Up are made to fine tune your car's aerodynamic abilities after you have installed other components such as a wing, splitter or diffuser. They can also be used to make your car look nice and low down to the ground without paying the money to lower it. The glossy carbon fiber finish is outstanding and catches the attention of just about anyone around and adds to the aggressive stance that the side rocker extensions give to your Audi A5. 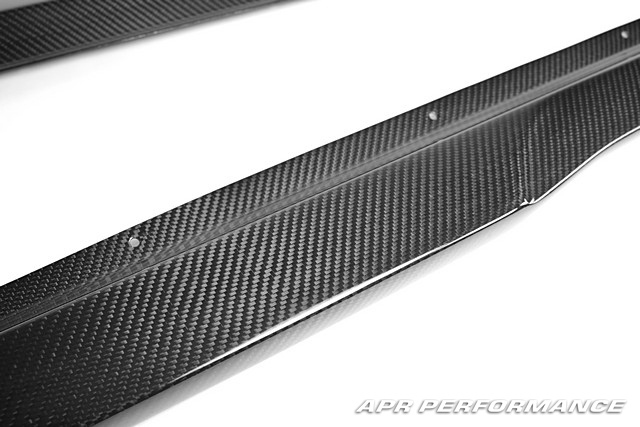 The performance aspects of the APR Performance Carbon Fiber Side Rocker Extensions are endless. They help keep air flow from gathering under the car and causing lift at high speeds on the race track. They can also help channel air to a wing and create less drag by creating a high pressure air system around the entire car. This allows for better stability and handling at high speeds because your Audi A5 becomes more slippery to the air around it instead of being slowed down by resistance. These side rocker extensions have many benefits and are sure to make you smile whether it's because of their pure beauty or the sensation that you get when you are planted to the ground at speeds in excess of 100mph. So if you're interested in getting a pair of APR Performance Carbon Fiber Side Rocker Extensions for Audi A5 2007-Up, give ModBargains a call at 714-582-3330 to make an order and schedule an installation appointment. Our mission is to give you the best modification experience for the best price.